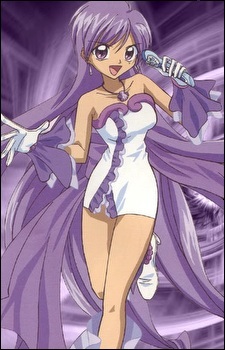 Caren "Purple Pearl Mermaid Princess"
Caren is the Mermaid Princess of the Antarctic Ocean, and the keeper of the Purple Pearl. She is the fourth Mermaid to appear in the series. Like Hanon and Rina, Caren also escaped to the human world when Gaito attacked her kingdom. However, even though she is found out by the trio, she refuses to join them. Initially, she shows hatred for Rina. Why? KCaren is the younger sister of Noel, who was captured by Gackto. She heard how Rina was with Noel at that time, and was told that Rina left Noel behind. (In reality, Noel sacrificed herself to save Rina.) Karen, therefore, resolves to save Noel on her own. Eventually, Karen saves the trio on various occasions, especially when the Black Beauty Sisters are introduced. Near the end of the first season, Karen sides with the trio as they are about to face the final battle against Gaito. After the defeat of Gaito, Caren leaves to help rebuild her kingdom. She returns to the human world with Noel and Coco, and they end up becoming comic relief. Caren also returns for the battle against Michel. At first, Caren is strict, and even a bit mean, but she starts to warm up to the trio and shows her playful side a bit. In Pure, Caren is energetic and playful, unlike in the manga, Caren's personality was not fully revealed. Caren has three different forms: Mermaid Karen, Human Karen, and her singer form, Purple Pearl Voice. Her image song is Aurora no Kaze ni Notte.